Councillors at Cambridge’s East Area Committee on the 28th of November 2013 were not keen on giving just one car parking space on Thoday Street, Romsey, over to parking for 8+ bikes. The meeting was told that a council survey of Thoday Street residents found about half of those responding in favour of the proposals and half against. A trial involving placing cycle parking racks in a car parking space has been carried out and the current question is if such cycle parking ought be made permanent. Councillors cited the lack of clear majority support for the cycle parking in response to their consultation exercise as their reason for not supporting it. The details of the consultation; and the responses to it, were not presented to the meeting and as far as I know have not yet been made public. I think this information ought be made public in the interests of informed debate. I would also like to know what was monitored before, and during the trial, and what the results show. How did taking away space for cars impact the availability of parking for them? Hester Wells I’m here on behalf of the Cambridge Cycling Campaign firstly to welcome promised cycle racks on Morton Road and Hinton Street. [I'm not sure those streets exist?!] Mawson Road and Kingston St. and also we would like to support calls for cycle parking on Thoday Street. We are particularly keen they should be positioned off the pavement in order to free space for people using push chairs and wheelchairs. Do councillors support the principle of more cycle parking in residential areas in the East Area? Cllr Noel Kavanagh : Yes, erm, Cllr Kavanagh from Coleridge ward. I’m also County Council cycling champ and I fully endorse the increase in secure cycle parking not just in the streets you just mentioned but also across the city. I work closely with the cycling team at Shire Hall to try to facilitate that so yes is the short answer. Cllr Blencowe : Thank you. Cllr Saunders had his hand up. Quite a few people have got their hand up. Cllr Paul Saunders : Thank you chair. The short answer is yes on the cycling thing. The parking on the street was a very good idea; especially if we can get it in places where it isn’t in the way of anything else. There must be lots of corners and bits of pavements that are not needed – we’ve introduced odd bits on Mill Road for example we’ve got some in by the tanning salon we’ve got some in there, there are lots of places. The Thoday one you mention is problematic and I’ve spent a lot of time talking about this one and in fact the people live nearby are very evenly balanced for and against and it’s difficult to come up with a particular public thrust so far and I think we need to do more research on that. Erm. You know it’s one of those things which affects people in different ways; some can get their bikes around the back, some cannot. 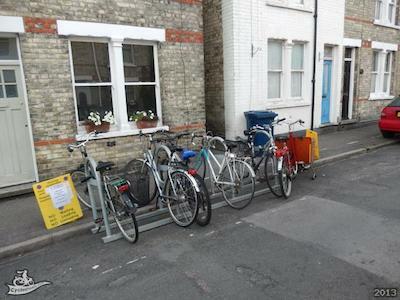 The permanent loss of a parking space is to many people a problem in the small streets of Cambridge we do have an over-provision of cars and a limited number of spaces and the loss of a space is to some people something they do not want. Personally as a cyclist and a driver I’m fairly understanding of both positions. So I think at this moment we have to do some more research on the Thoday one to see if we can get a better view of what the people who actually live there really need . Hester Wells : Can I just point out a further thing; as you say residents were split 50:50 on this. It seems to be we’ve got a 50:50 split but we’re talking about a minority of the street, just one car parking space, not the re-allocation of parking across the whole street. Therefore taking a view …. doesn’t seem to me to necessarily be quite the way to deal with this. [I think the suggestion is that as it is only one car parking space being lost; the support of only a small minority of residents should be sufficient for the scheme to go ahead]. Cllr Blencowe : OK. Do other members wish to address this question. Cllr Zoe Moghadas : Erm yeah again you know the short answer is yes to the question that I’m all in favour of more cycle parking, as Cllr Kavanagh said we need to look at it right across the city. Just on the back of what you were saying on Thoday Street I think because we are essentially representing all residents so actually we do have to really look carefully at what is being said. Thoday Street, two separate residents approached me asking for more cycle parking, particularly with one resident who was giving up their vehicle with the aim for their family to be more cycle… a cycle friendly family but realised the houses, his hallway, didn’t really accommodate all the bikes with the kids so erm, I’d put that forward to officers and obviously that then triggered consultation across the street and you know when that consultation came in it was split so the way forward with that is looking at that again which is happening so I’m hopeful that I think actually it’s a really good example but it does need to be done democratically and it was inconclusive when that one asked for residents’ views but the number of residents who engaged and came back on that consultation wasn’t in my view extensive enough which is why it has been floated again. So I’m really hopeful that that can move forward and there have been as Cllr Saunders has noted some new cycle racks which have been put in. I was grateful to those outside the tanning salon tonight when I was looking for somewhere to park my bike. I hadn’t spotted those before so I thought: “Yeah brilliant.” Erm I think that’s all I’ll say on that, but yeah I’m completely behind it and I’ll be looking at that and welcome other residents in other streets to come forward and we will do similar as I’ve done for Thoday street residents. Cllr Blencowe :Cllr Saunders to come back then Cllr Smart. Cllr Saunders : Just I thought I’d better just mention I am a member of the Cambridge Cycling Campaign so I have an interest in this. Erm cycling does matter to me; this is not something which I take at all lightly, in fact living in the centre of Cambridge I’ve actually sold my car which hopefully helps this issue and actually I do take public transport or walk most of the time. But, my job as a councillor is to take the interests of everyone in line so I do have to look at the results of the consultation and look at what’s in the greater good. Cllr Smart : I think one of the problems is that people do have a tendency to think that the piece of highway outside their house belongs to them and therefore when they give up their car they can ask for cycling provision outside because they’ve given up their car which you know we all know the highway is the highway and in any case if there are cycle racks there that means a car can’t park there at all even when the person who believes it is their space as it were isn’t there. It is not as straight-forward as sometimes it looks as though it ought to be. As both several people have said the consultation was absolutely split. Now whether everyone who, while some people say if you agree with it people tend not to respond and that is perfectly true but I think we really do … it’s not clear what the should be done so therefore doing it, whatever it might be, immediately, is not an option because it is not there. As others have said we do need to look at it further, particularly to encourage people to respond if they are in that particular stretch of the street because that I think is the crucial issue, not if myself who lives in the parallel street thinks it is a good idea or not. But those people who live in that part of the street think it is a good idea, that’s the crucial thing. We shall see. Watch this space. Cllr Blencowe : OK. I think a variety of answers there. I don’t think small numbers of residents in the immediate vicinity of a scheme, be it cycle parking or any other work on the highway, should be allowed to derail it. If councillors are elected on a platform of, for example making the city a more attractive place to cycle, they should have the confidence to get on with pursuing attempting to deliver what they have promised without worrying about repeated, interminable, consultation exercises. I think the focus on consultation is a result of councillors who lack confidence, and lack a mandate. If we had higher turn out in elections, and councillors who really had the support of a majority of their constituents they could enact their promises and visions; as it is though the majority of people invariably don’t vote for any of the councillors on the ballot at election time. I would prefer a strong representative democracy rather than the “treat consultation responses as a referendum vote” approach to democracy espoused by Cllr Moghadas and Cllr Smart along with many other of our councillors. Cllr Smart’s position appeared internally inconsistent as on one hand she was arguing people don’t have a right to decide what happens to the road outside their homes, but then argued that it was the views of the residents in the immediate vicinity of the proposed cycle parking that were the most important factor. Cllr Smart gives little weight to the views of a single household, but large weight to those of a handful. It may be that the provision of better cycle parking takes a long time to have an impact; and perhaps for the numbers of cars used by residents in the area decreases. It would be interesting to know what fraction of the population in the area own cars; and if the vast majority of the street space is currently being given over to benefit a minority of people. I wonder how practical outdoor, on street, cycle parking is for keeping a reasonable quality bike in good condition for regular, practical use for things like shopping and commuting. In my own personal experience bikes deteriorate rather rapidly when left outside. Should we really be aiming higher than providing the kind of racks that are probably more suited to visitors than everyday parking of someone’s primary form of transport? This entry was tagged Cycling, Democracy, East Area Committee, Romsey on November 29, 2013 by Richard Taylor. I’ve tried the URL given in that video by Cllr Moghadas http://eip-projects.cambridge.gov.uk but there doesn’t appear to be anything there; perhaps despite suggesting people “log in” to it; what she was seeking to refer to was the EIP projects email address given on the council website. It does rather beggar belief that councillors can be so feeble about this. If a resident wants cycle parking outside their home, why on earth can’t they have it? I think Cllr Smart is right to say residents don’t own the street outside their homes; councillors do have to consider the needs of the area, and city, as a whole when deciding how to allocate space on the roads. It’s not as simple as giving people what they want outside their own homes. I think it is a fair point that residents do not own the bit of street outside their house. However, this is effectively what has been permitted to happen anyway, with residents’ parking taking priority over the ability of everyone to use pavements. It is very common to see people walking down the middle of the road in Romsey because pavements are unpassable due to legalised pavement parking. It is very important to the Campaign that if any cycle parking is installed, it should be positioned to free up the pavement, not just replace a car on it. It is worth pointing out that the resident in question would have no assumed right to the cycle parking if it were there, and acknowledges this. There is no question of laying claim to protected space; it would be a community facility. During the on-street trial the racks quickly became used by neighbours and visitors without publication of its presence. That should be Mawson Road and Kingston Street. On-street cycle parking is to be provided in those two streets outside the Live and Let Live and Kingston Arms pubs. Apparently extra car parking spaces are being provided nearby (by the removal of yellow line restrictions) to keep the total amount of car parking unchanged. There are too many cars in Romsey and pavements have already been turned over to car parking on most streets. That’s why there isn’t enough space for bike racks, it’s not that the pavements are particularly narrow. On the other hand I do own a car myself and it’s not easy to transport a baby, a dog and shopping bags from car to house unless you can get a space nearby. If I can’t even decide my own view I do have some sympathy for councillors trying to balance the differing opinions of lots of local residents. However, I have to say I think the Lib Dems are being disingenuous. Cllr Paul Saunders recently wrote me a personalised letter about what his party are doing to promote cycling and now I learn that isn’t backed up with action. It’s also worth remembering that his predecessor Cllr Sarah Ellis-Miller was elected on a green manifesto in 2000 and then immediately bought an enormous 4×4 which she continues to drive around Cambridge this day. In fact the only time I ever saw her with a bike was in a photo on one of the Lib Dem’s leaflets! You could drop everyone off outside the door, then drive somewhere else to park the car longer term. Alternatively try a cargo bike plus hiring a car for more awkward journeys. In some US cities the parking is far from the apartments, which forces people to walk or cycle for shorter journeys, thus it’s the same here re lack of space. Shaun – there are always sensible solutions and there are always new problems you couldn’t have imagined. I’m sure that’s why the Cycling Campaign don’t advocate banning cars entirely. The dog is what causes the most complications as he is not allowed in hire cars and can’t be left with a baby! On the transcript: streets where cycle parking is planned are Mawson Road and Kingston St, outside the Live and Let Live and Kingston pubs. Crucially, this has been permitted because parking spaces will be moved, so no overall loss of parking. On Thoday St there is no possibility to do this, because all the space is already taken up by parking, to the detriment even of pavement use. The point I was trying to get across in my interruption, which I don’t think I made well, is that it is a very specific interpretation of democracy which endorses the principle of 51% of respondents dictating use of 100% of the street (although in this case it is not necessarily the 51% in favour of retaining the parking space). If they were allocating the space on the entire street from scratch, and 20% of residents said they wanted cycle parking and 80% said they wanted car parking, would the just solution be to allocate 100% to car parking? That’s not an easy point to get across in a quick interruption; I think the point was made though. @RTaylorUK I said "X cycle spaces", not "eight". I wonder if there’s a different question that could be asked, which is about the parking space in a particular place, so most of the street realises they never park there anyway, and Sarah’s point about it getting bikes off the pavement is also important. Phrasing probably matters a lot in getting people to agree. I wonder what would happen if the Cycle Campaign put leaflets trhough every letterbox on the street, asking what level of parking should be allocated to cars or bicycles on the street. I doubt many people would respond at 100% car. The total lack of leadership shown by Councillors here is extraordinary, especially for a city like Cambridge, and when so many pontificate in great length in election leaflets about how they are supposedly cycle-friendly. If we can’t allocate a tiny bit of cycle parking in a street with such obvious demand, what hope is there? We have to put this issue in context. There are NO, as in *ZERO*, cycle parking spaces on these streets. There are hundreds of car parking spaces, all at the expense of pedestrian pavements. 99% car parking provision, 1% cycle parking provision. It’s incredible that a 51% in favour survey, 49% against should block a tiny change to such an obvious and imbalance in provision. Doing yet more consultations is just kicking the can down the road. The issue is *not* going to go away. Councillors should just get on with it now, rather than have this debate rumbling on for years pointlessly, with theft continuing, and pavements being blocked to the detriment of pedestrians. A few months after cycle parking is installed, everyone will have forgotten that there was even a debate on this. People will cope. You’re speaking sense Martin – but you’re not quite reaching what seems the most obvious conclusion. When it comes down to it councillors here mostly talk a good game for cycling and cyclists – they say they’re cycle friendly, they say they’re pro-bike, but by any objective measure they aren’t. This isn’t a lack of leadership from councillors – its councillors bending to pressure from very vocal, very active car owning busybodies who see cycling and cyclists as a threat. Cllr Saunders says that “in the small streets of Cambridge we do have an over-provision of cars and a limited number of spaces”. He then presents no solution. How will this “over-provision” ever be solved if Councillors don’t provide proper alternatives, i.e. secure cycle parking? 1% change in car parking isn’t a significant level anyway. 1% will be lower than the natural level of variability anyway given that people are sometimes away or have fewer visitors on any particular day. Cllr Smart is also inconsistent in stating that the consultation was split 50/50 (though actually there was a slight majority in favour) but then says that people in favour of things tend not to respond; she is in fact therefore suggesting that in reality those against are the minority. Councillors have failed to explain why residents who have cars are being given public space, but those who do not are denied it. Why is the type of vehicle significant? Taken to a hypothetical and silly extreme, would Councillors prefer that a resident buys a clapped-out van, parks it in the street permanently, and then put their cycles in there? The effect would be the same, but surely such a van would be less desirable, and take up even more space, as well as denying use of the space for others? Personally I don’t see the benefit of further consultation. There’s already been extensive consultation on such a tiny change. Councillors should just get on with it and move on, and stop wasting officer time on this. @camcycle Will write a blog on this issue soon. I have always said parking on terraces was something where I would ask for residents views. If Romsey’s Cllr Bourke writes his promised blog post it will be his first such article of the year; his last was written in December 2012. As suggested above, I think councillors should show some leadership here and get officers to work up a scheme that gets bike racks installed in every street in Romsey, not just for the people living there but for their visitors too. Then can we look at other areas on the city which would also benefit from residential cycle parking? Bemused, as an incomer to the area! Why is parking on the pavement allowed? Obstructs pedestrians, causes difficulties to pushchairs and prams, restricts access for refuse and emergency vehicles. Why should people be allowed to park cars on the pavement/road – in a way which obstructs others. I suppose you will tell me that the residents have to park somewhere – but if no parking were made available, only people without cars would park there. Romsey is bad enough – but York Street (for example) and Devonshire Road where parking is permitted, effectively turn the streets into one-way traffic streets. Pausing your vehicle to unload a disabled person, or offload shopping, effectively totally blocks traffic. I never cease to be amazed (as an incomer) just how much poor quality energy-inefficient poor amenity housing exists on Cambridge – terraced rows that in other towns would be likened to slums and demolished. Here they are seen as desirable and change hands for a small fortune! And new housing is inevitably 1/2 bedroom flats, for the buy-to-let market, with a planned parking density that doesn’t relate to actual need and shoves even more parking on adjacent streets. The ideal with car parking for new developments is having a secure car park for all residents within about 5 minutes of the front door but cycle parking (or facilities for said) much closer/right outside houses. There isn’t the room to do this with the terraced houses already in Cambridge (and I’d argue with your point about them being slums. The ones I’ve visited are very nice. Tsk.) Some people will still need cars though (especially if they have mobility problems) but again, ideally, more car clubs would be available for people to use to reduce overall car ownership. We’re a long way from that though and given the way councillors respond to a simple request such as the modest one for Thoday Street, my guess is we’re best off not holding our breath. I’m bemused by Kevin Blencowe’s closing remark ‘OK. I think a variety of answers there.’ – it seems obvious from the transcript that the councillors were basically saying yes to cycle parking, though with some havering. Blencowe seems to have closed it down for his own reasons (he thinks of cycling as some elitist LibDem pursuit). While Cllr Kavanagh was supportive without caveat; all the others were saying they supported the idea of more cycle parking, but didn’t want to remove any car parking to provide it. Elements of the video included in the above article were shown at the Cambridge Cycling Campaign open monthly meeting on the 3rd of December 2013. Had managed to avoid watching myself on film until @RTaylorUK's #eac film shown @camcycle monthly meeting. There was discussion of how best to campaign for the cycle parking. It was noted this isn’t something which there is a party political split on. One person present stated only Labour or the LibDems could win in Romsey; my view is that perhaps the kind of antics we’ve seen from party politicians in cases like this might lead to residents electing an alternative. One key question was if to try and have input to the formal consultation which would accompany an application for a Traffic Regulation Order; or to try and win the argument before then. My own view on this is the TRO consultation is an archaic process primarily involving wasting public money on very expensive adverts in tiny print in the back pages of the Cambridge News. For councillors to embark on the costs of the formal process they need to be sure they’re going to go ahead with the proposal otherwise they’re wasting money on the process. The Thoday street case is different to Kingston St and Mawson Rd as the meeting heard that in those cases provision was linked to providing cycling parking for pubs and there was no net loss of parking. There wasn’t this much bother over installing new racks in the city centre. Someone (either Tim Ward or CCyC) had the idea, and officer or two drew up plans having gone out and thought through where they could go, this was consulted on and they will get put in, aiui. There won’t be (m)any residents parking/car storage spaces going as a result, it’s true but the whole process shouldn’t be any more complicated than that to install racks anywhere in the city. It isn’t, as they say, rocket science. Public Roads are just that.Not public car or cycle parks. Need to ban cars parking on roads, and provide dedicated cycle parking under cover. Perhaps a higher rate of excise duty for vehicles that do park on road is required. Benefits will be pavement cleared of bikes to help walkers, reduced cycle theft, and increased transport choice. Let's get in place now. Since the new racks have been installed on Mawson Road and Felton Street I have noticed that the racks outside the front of the Salisbury arms and Nip-in shop on Mill road have been removed. Not sure if they were both council owned racks, but they were heavily used and very useful. Formal Traffic Regulation Order to be published soon.